* Battery cap can be difficult to use. * Does not include battery. * No external tank to break off. * Holds 10ml of e-liquid. * Wide range of vapor settings. 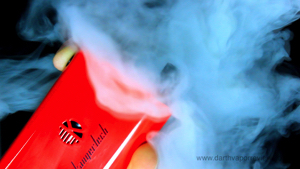 KangerTech, one of the earliest electronic personal vaporizer manufacturers in China, was established in 2007. Due to the primary focus on innovation and invention, their vaporizer models are quite popular in North America and the European Union. They uphold the highest quality standards -- therefore, all KangerTech products must pass CE, RoHS and SGS certifications and meet the international environmental management system's rigorous ISO 14000 standards. The NEBOX is Kangertech's first all-in-one device. 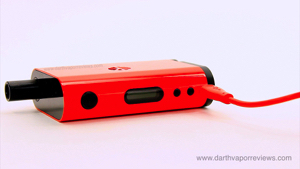 It combines a mod and a tank together into one 60w temperature control box mod with a 10ml e-liquid capacity. The kit comes with a pre-installed Ni (Nickel) 200 wire, stainless steel housing OCC head at 0.15 sub ohms. A NEBOX instruction manual, four - black battery stickers, a Kangertech authenticity card, a using guide, a micro-USB cable, a Japanese cotton sheet, mini blue screwdriver with spare coil and screws, a stainless steel 0.5 ohm OCC head, a mini RBA Deck Plus and a delrin drip tip. To get started vaping, you'll need to insert a 20amp, 18650 battery which is not included in the kit. On the bottom of the NEBOX is the battery and e-liquid caps. You'll need to use something like a quarter to open the caps, which I found to be annoying. Especially, after being accustomed to the SUBOX Mini quick connect magnetic battery cover. The battery cap is spring loaded so you'll need to add some pressure when you replace the cap. The first three battery changes were tricky and I was afraid that I would strip the threads, but it finally seemed to wear in a bit and became much easier. You can charge the battery by using the mini USB cable. It is recommended to charge the NEBOX on it's side due to possible heating of the caps which have the potential of leaking. To fill with e-liquid, unscrew the e-liquid cap. 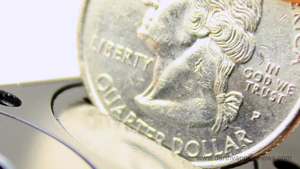 You don't really need a coin for this one, but it has a slot if you need it. 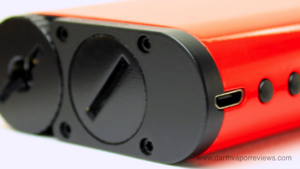 The NEBOX comes with a pre-installed 0.15 sub ohm coil which has a new, rounded design. The square Subtank coils and the new, rounded NEBOX coils are interchangeable. Fill with e-liquid like you normally would avoiding the center air hole. I started filling with the dropper, but it took too long, so I just slowly poured the bottle into the tank. It works great and if it's the end of the bottle, a 15ml fits perfectly in the top. Once filled, replace the cap. Keep in mind, this tank is made of plastic, so any cinnamon or citrus flavors have the potential to crack the tank. The kit also comes with a Ti (titanium)0.5 ohm OCC head and a mini RBA Plus. To use the RBA, loosen the set screw with the little, blue screwdriver and remove the casing. the RBA comes with a pre-installed coil as well as a spare. Cut a strip of Japanese cotton, twist the end and gently feed it through the coil. Snip off the excess and replace the casing. Tighten the set screw. You can adjust the cotton from the top by unscrewing the top cap and moving the cotton around to your desired position. Replace the cap and your RBA is ready to go. To use the NEBOX, five clicks of the power button will turn it on. Adjust the wattage and temperature controls using the plus and minus buttons. Press the fire button three times to bring up the basic settings for the type of coils being used. Hold down the plus and minus buttons together to access the advanced settings which feature six customizable modes. You can lock your settings by pressing and holding down the fire button and the plus and minus buttons at the same time. The last thing to do is to snap in the delrin drip tip into the 510 slot and you're ready to vape. The more I use this mod, the shorter the con list gets. This really is a great kit! My biggest complaint is with the battery cap. Sub ohm vaping can really kill some batteries, so I'm replacing this cap a couple times a day. It's really a small con in the big picture, but I think it's an area worth improving. I messed around with the temperature controls a bit, but it's not for me. The standard wattage settings were enough to make me happy. the NEBOX has no airflow control and it really doesn't need it. It actually provides a wide range of vapor production and I think it would be a great mod even for a beginner vaper or a current smoker looking to switch to vaping. Obviously, the 10ml e-liquid capacity is pretty awesome. It can last all day if you don't go too crazy with the clouds, before needing to be refilled. It's taller and wider than the KBOX mini and I'm not sure if it's by design, but it's the exact dimensions of a hard pack of cigarettes. Possibly, a design smokers might find familiar. I love the paint job! It's a fingerprint magnet, but it's extremely durable. So far, the coils have performed nicely and I love the mini RBA. The delrin drip tip is also a nice, clean and teeth friendly accessory. Overall, for the price, this is a great kit with all the tools you need to start vaping, except for the battery, but that seems pretty standard for mod starter kits.